Published: Sept. 9, 2015 at 03:20 a.m. Updated: Sept. 9, 2015 at 10:52 a.m. The season finale of Hard Knocks can be a tough watch. High-profile names like J.J. Watt, Arian Foster and Vince Wilfork may provide the HBO series with necessary star power, but much of Hard Knocks' emotional heft comes from the everymen who populate the bottom of the roster. Players like cornerback Charles James II, who literally hides in his locker when The Turk starts making his rounds. Or linebacker Kourtnei Brown, who's been cut a half dozen times and is running out of chances at age 27. You learn to like these guys -- you relate to them (in as much as one can empathize with a professional athlete) -- which makes it all the more difficult to watch the 800-pound anvil dangle above their heads. When James learns that defensive tackle Louis Nix has been released, he can hardly believe it. "That was a third-round pick a year ago!," James tells locker mate Kareem Jackson. "God, this s--- is crazy." Jackson leans on the teachings of one Christopher Wallace in offering a pointed, impactful response. "And if you don't know, now you know." James is cut later the same day. This is a hard business. When Hard Knocks favorite Uzoma "E.Z." Nwachukwu gets called into the coach's office, there is no ego massaging. Bill O'Brien respectfully explains to the undrafted wide receiver that -- just like last year, and the year before that -- he's not good enough. "For me, I've gotta get a guy that can run the gamut of routes a little bit better than you," O'Brien bluntly asserts. Ouch. After O'Brien delivers the bad news, E.Z. doesn't rush out of the room. He sits in his chair passively before standing up and taking a deliberate walk to the door. He's like an inmate waiting on a fate-swinging call from the governor. There will be no last-second reprieve. "Devastated I think would be a good word," said Nwachukwu, a guy born for the Hard Knocks treatment. "I thought it would go in different way, but it didn't." When Brown gets his bad news from Texans general manager Rick Smith, he doesn't bother to mask his disappointment. He doesn't even try to speak. He had three sacks and a defensive touchdown in the preseason and still got cut for the seventh time since 2012. What else can be said? The silver lining is that all three players landed on their feet. James was scooped up by the Ravens. Nwachukwu found a new home and a fresh start with the Dolphins. Brown landed with the Buccaneers. There was no fairytale ending on Hard Knocks, but their stories will continue. » The biggest upset of Hard Knocks? How damn likable Bill O'Brien was. I thought an early scene in the finale captured O'Brien well: After BOB erroneously barks out condemnations during a practice drill, he punishes himself by doing push-ups on the field. Before Hard Knocks, I figured O'Brien was just another humorless Belichick disciple. But could you ever picture The Hooded One banging out arm exercises as penance to his players? » Yes, O'Brien impressed both as a coach and a person, but how could I hand out the coveted Hard Knocks MVP award to anyone but Vince Wilfork? The big man lived up to his reputation, delivering fun moments in all five episodes. The MVP award was locked down when he took on U.S. Women's National Soccer Team star Carli Lloyd in a field-goal contest, matching Lloyd on kicks from 25 and 35 yards out. The funny thing about Wilfork (and NFL big men, in general): We see the big guts and chugging movements and forget these guys were the greatest athletes to ever come out of their respective high schools. As Wilfork drilled field goals (and I mean drilled, those suckers nearly went through the net), I thought back to his basketball exploits in Episode 1. Wilfork put on a different kind of 3-point display in that episode, all while repeatedly referring to himself as "MJ." So congrats, Big Vince. Feel free to print this passage out, frame it and hang it beside your Super Bowl rings. » One of the biggest bummers about Arian Foster's training camp injury -- you know, besides the whole groin-ripping-off-the-bone part -- was that it effectively removed the NFL's version of Confucius from Hard Knocks. He has a brief cameo in the finale, but we're still left wondering what might have been. Arian offering strong takes at an art gallery. Arian playing Spanish guitar while wearing fedora. Arian taking the megaphone at a hyper-specific demonstration rally. Alas. » I came away impressed by the relationship between O'Brien and Rick Smith. Are both men on their best behavior with cameras in the office? I'm sure, but there seemed to be genuine respect there. We never see them disagree once, which shows a clear vision from the top of the organization. » OK, time to answer the question I've wrestled with for five weeks: Do J.J. Watt's teammates actually like him? My conclusion is that Watt is universally respected, but not necessarily popular in his locker room. He seems to exist in his own world, like the gifted kid in elementary school who is reading Twain while the rest of his class is playing kickball. Two things that jumped out: Remember when he rapped to that cheesy Fort Minor song in the premiere? You just know that achieved a perfect 158.3 Eyeball Roll Rating among Texans players and coaches when they watched the episode. Then there's the scene in the finale where Watt graciously takes a coterie of teammates on a private jet to Dallas for a Wisconsin football game (two of Watt's brothers are Badgers). Watt makes awkward small talk on the jet, offering up a dubious factoid about how the plane's carpet cost $100,000. No one even knows what to say. Conversation is dire! It's telling that this was deemed by HBO and NFL Films to be the most entertaining aspect of the flight. Which doesn't mean Watt is a bad teammate. Far from it. We saw multiple instances of players coming to him for pointers or encouragement. But you want an answer and I'm giving it to you: J.J. is respected, but not one of the cool kids. Glad that's settled. 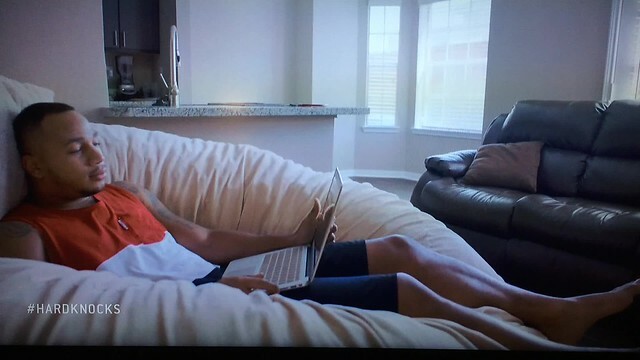 » Watch this clip and tell me that Chris Polk's mom isn't angling for a reality series. She's practically reading off cue cards, and that's before we get to the merch! Can't knock the hustle. » "Guys, don't fart in the meeting room. If you got to, f------ leave. Seriously. That's nasty." It's telling that this blooper reel snippet from a positional meeting made me laugh harder than anything all season. I am perpetually 9 years old when it comes to bodily functions. » "You gotta earn it every f------ day." Bill O'Brien is in the Eff Bomb Hall of Fame. They're waiving the five-year waiting period and inducting him immediately. It's only fitting that the coach has the last (profane) word on a great season of Hard Knocks. Thanks to everyone who followed along with our recaps. Let's do it again next summer. HBO will air an encore presentation of Episode 5 on Wednesday at 11 p.m. ET. Follow Dan Hanzus on Twitter @DanHanzus.